Wright State’s Earth and Environmental Sciences degree programs provide excellent background and training for understanding and addressing two of humanity’s greatest challenges for the foreseeable future—the needs for sufficient amounts of water and energy. With global need for scientists who understand the geologic and environmental ramifications of these important resources, now is a great time to prepare for a career in one or both of these sectors. 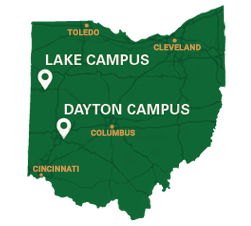 Wright State’s research facilities include state-of-the-art laboratories and additional analytical equipment is housed in the Environmental Analysis Facility. These facilities provide students with training and experience in field data acquisition, modern analytical techniques, sophisticated data processing, and computer modeling. The Department of Earth and Environmental Sciences offers research and educational programs that focus on earth processes and complex ecosystems. We explore interactions among processes that involve the biosphere, lithosphere, atmosphere and hydrosphere, fostering a cross-disciplinary perspective to meet the current and future challenges of resource development, conservation, and environmental health and quality. Our academic programs include many unique course offerings and multiple research opportunities in both undergraduate and graduate degree programs. Undergraduates can complete independent research and a senior thesis. Experiential learning is available through our working relationships with county boards of health, park districts, EPA offices, and local businesses. Students can also earn academic credit for undergraduate teaching assistant assignments. Our graduate programs include three master’s degree options—Master of Science in Earth and Environmental Sciences (thesis and non-thesis) and the Earth Science Master of Teaching, an excellent professional development opportunity for teachers. Looking ahead, consider Wright State’s Environmental Sciences Ph.D. program, which includes many Earth and Environmental Sciences faculty members who also teach at the undergraduate and master’s degree levels. Suzanne Semones is a mentor to the students, staff and faculty of the Department of Earth and Environmental Sciences. Alison Agather, who earned her Ph.D. in environmental sciences from Wright State in December, helps to identify emerging issues in the Arctic as a fellow with the National Oceanic and Atmospheric Administration.